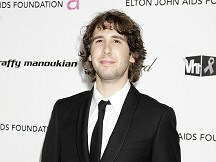 News - Groban: Make me a woman for a day! Groban: Make me a woman for a day! Josh Groban has said he would jump at the opportunity to be a woman - but just for a day. The US singer, who has been touring around the UK, revealed he would love to swap sexes for a day, to find out what goes behind toilet doors. "I would absolutely take it, if I was offered the chance. I would go to the ladies' rooms and look around, then gossip - before voting for President and try to change the world," he said during his show at the HMV Hammersmith Apollo in London. "I feel limited as a man. You women need us for certain things, but not for others," added the 30-year-old. Josh, who relocated from Los Angeles to New York, admitted he is considering buying a home in the British capital because the UK feels like his second home, having appeared on TV show Never Mind The Buzzcocks, and performed at the Royal Variety Show in 2008. "I always have a great time in this city. I feel like I could buy a flat here," he said. The singer, who has appeared on Glee and Crazy Stupid Love alongside Emma Stone and Ryan Gosling, added: "It's a place that always welcomes me with open arms, and I wrote my entire Christmas album Noel here."